Bayfield Wisconsin on Beautiful Lake Superior! Okay Mom, you can quit loading stuff in the car for our trip to Bayfield now!! Leave some room for us!! What a whirlwind trip it was! Rushing around to get things packed! We did have a great time despite Dave developing a toothache and me a gigantic sinus headache from which I am still recovering. 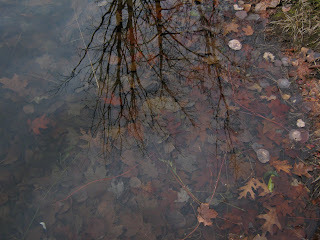 I'll leave you to view a few memorable shots I took of the scenes we viewed. There is no place in Wisconsin quite like Bayfield. I have more photos to share but need to rest up a bit before I do! Hope you enjoy these! 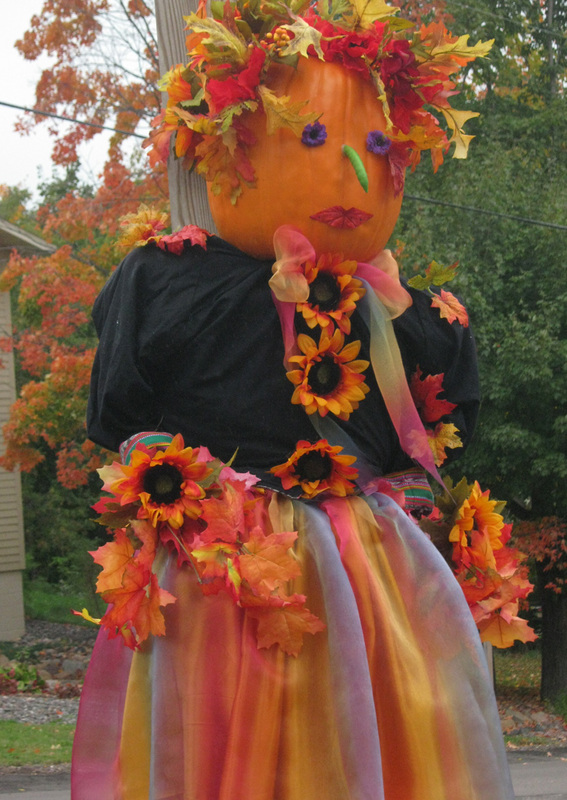 Sue....who has a blog called October Girls is our number one winner! 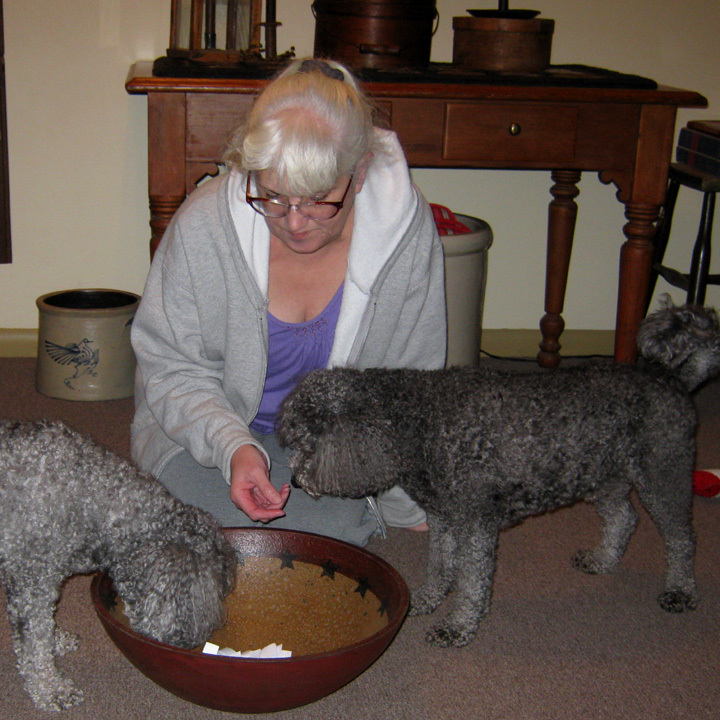 Had to throw a few Buddy Bits in the bowl then Smokey touched the next slip with his nose. 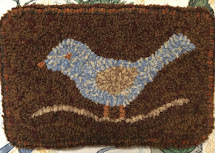 It was Carol Miller, whose blog is TicklePie and who is a bird collector( she's gonna have fun with the 3 birds in this pattern!) Then a few more Buddy Bits and they lost interest in the whole drawing thing..... But Boys, we need one more name....I had to grab the last slip...... Whoo HOO Julie! Her blog is Hook Worm ! Congratulations to all you hookers! And thank-you from the bottom of my heart for ALL your entries and the sweetest of comments and congratulations on my first year of blogging! It has been so much fun. If the winners would email me their addresses at (antcathy@charter.net ) I can get your packages out to you pronto! Last Call To Sign UP For My Give-away! If you haven't signed up for my one year blog anniversary give-away and want to get in on it, better hurry! I will draw three names tonight! 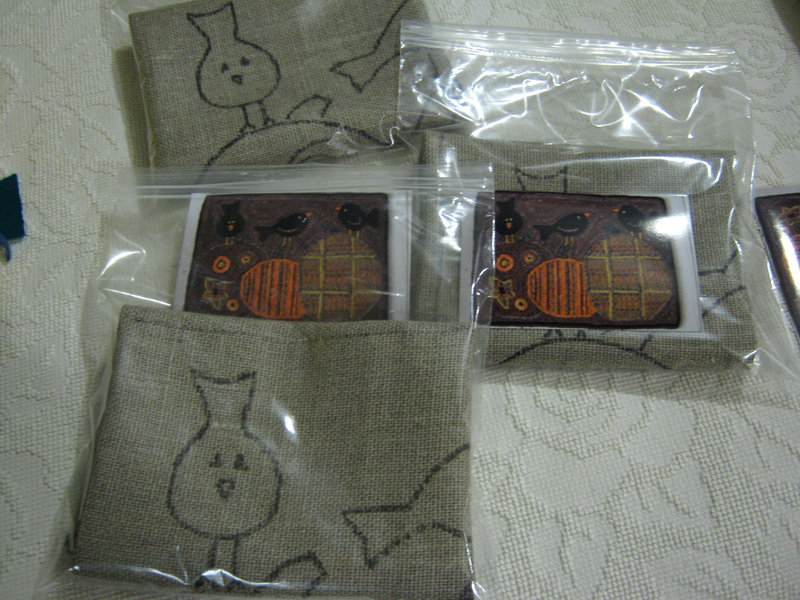 The patterns are drawn and ready to make a trip to some one's house! 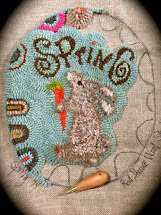 Remember, all you have to do is leave me a comment telling me that you'd like to win the pattern. It's the Autumn Trio one pictured up there in my blog header. You don't have to be a follower to win but I invite you to follow me for this next years blog adventures! Our current adventure is coming up! We are planning a much needed little trip to Bayfield, WI. It seems the only place on earth I can get my dear hubby to really sit down and do "nothing"! There's a room ready and waiting for us on the shores of Lake Superior about a two and half hour drive from here! My camera is packed along with Smokey's insulin and syringes etc. Both dogs need baths and haircuts yet. 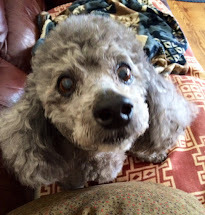 Max is going to the vet this afternoon with Dave to get his nails trimmed. He won't let me do it. He can be a naughty little thing and throws all of his 25lbs. into a squirm and tug of war when the nail clippers comes any where near him! LOL! Lots to do yet to get ready for the trip. So we'll see you in a few hours with the lucky winners names! The Celebration Continues!! Come Join In!! Finally!! I'm sitting down to continue what is supposed to be my Celebration of one year of blogging! Hubby is on vacation for a couple of weeks and things tend to end up in an uproar around here! It takes him two or three days to settle down and relax a little. HMMMMM did I just say relax?? I'll explain later. First back to my blog celebration! I have been wanting to have a give-away for quite some time. I haven't been able to decide what to give-away! If you follow my blog you know that I have won my fair share of give-aways. (I'll be writing a tutorial soon on how I do that....LOL just kidding!) 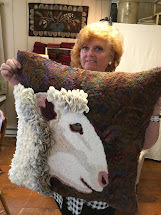 I'm humbled that I just won another one over on Kelley B's blog KankNChester and I'm thrilled to death to get one of her patterns! 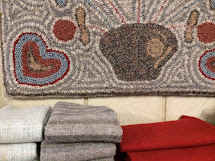 I have long admired how she designs such charming, simple and primitive rugs! How do you do it Kelley?!!! I have tried my hand at designing and am a novice to say the least. 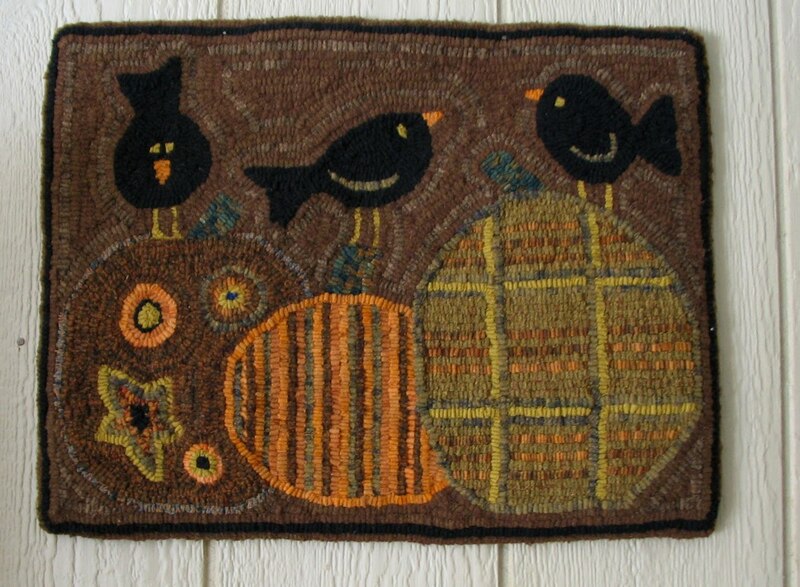 When I first started hooking a few years ago, I designed the Autumn Trio rug that you see up there in my blog header. 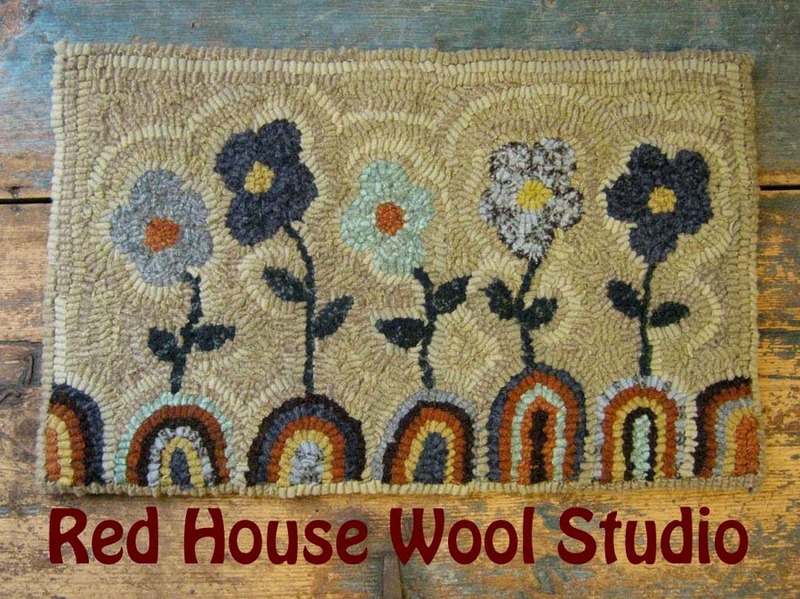 I was honored beyond words when my rug hooking teacher and friend Irene actually wanted to buy my pattern and hook it! Not to brag but it is a fun pattern to hook! 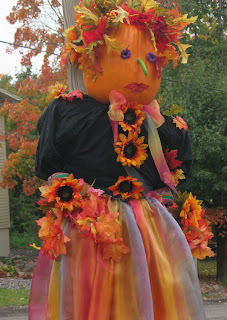 It is such that you could do the pumpkins in a lot of different ways and make it your own! 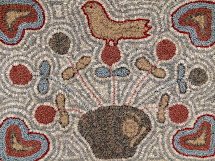 The birds could be different colors etc. 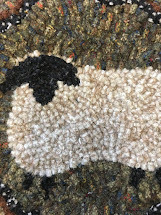 So I decided to go back to my beginnings in rug hooking to celebrate my year of blogging and give away three patterns! One each to three of my wonderful blog followers! 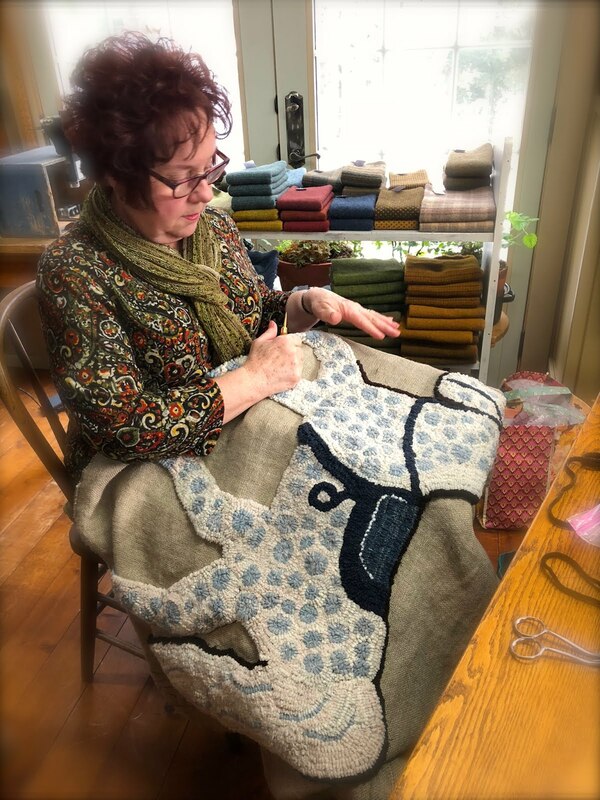 The pattern is drawn on my favorite Michele Micharelli 100% natural linen. It measures a nice size of 19 1/2 by 14 1/2 inches. 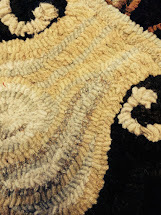 I'll send along a photo of my finished rug for inspiration! Just leave me a comment letting me know you would like to enter! That's all! Gosh, I'll do anything for comments! we'll have a drawing in a few days! I have a few more surprises up my sleeve as this celebration continues! Julie, you may get your answer yet so stay tuned!! So here is my Dear Hubby "relaxing on his vacation"! Boy, there's a lot of boards to paint on that deck! Better hurry up and get that done before it rains sweetheart! The calendar on the wall is shouting at me "Hey! Have you noticed it's MID September already?!!" Yes, yes my dear calendar. I needed some down time this past few weeks so I chose to ignore you. A death in the family, a thyroid gone wacky, a root canal, an offer on my Mom's house, amongst the few things that have contributed to a block of time that I have to admit I'm rather glad that it has passed quickly. 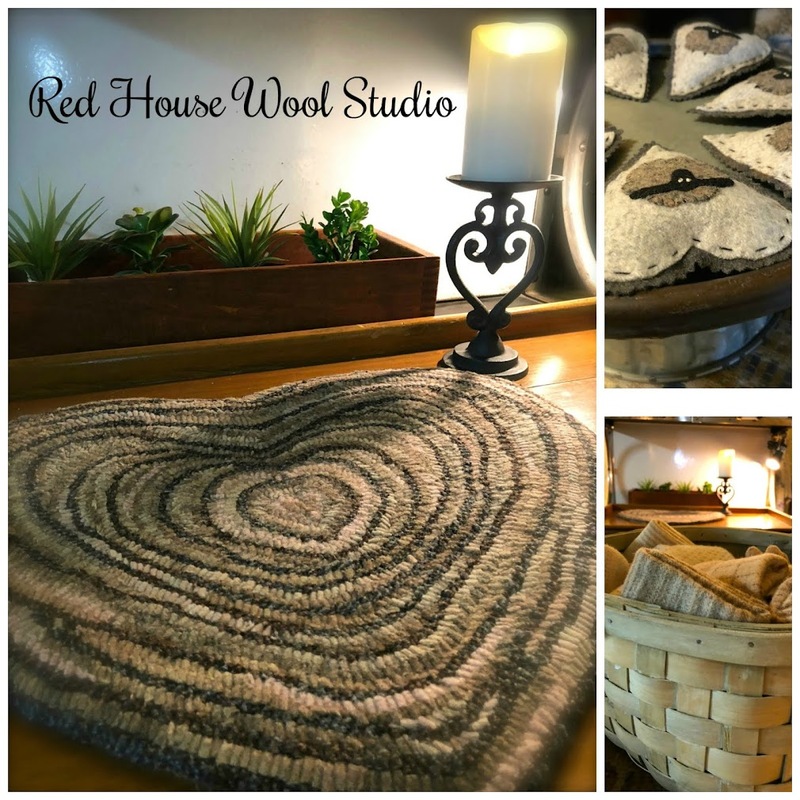 This past week I needed to touch my wool again. While out in my studio getting reacquainted with things I suddenly had the urge to change some things around. So I swapped out the old metal bed for this cute little antique curly maple bed that was hanging out in the guest bedroom in the house. The old ladder with blue milk paint was destined for a garage sale but I rescued it from the garage and propped it next to the bed. I started to feel like my old self again after puttering around this way for a few hours. 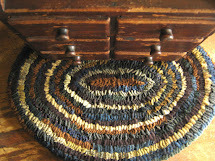 I dumped a few hand torn strips of wool into a big bowl and grabbed my hook and started hooking. Just wanted to show you the arrangement I made for Dave's brother's funeral. I had this old rusty shot-gun milk pail in the basement. Dave and I fought an army of mosquitos to pick some wild tansy and dried weeds in the ditches near here. 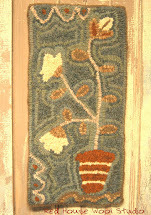 I added a few silk fall flowers and ribbons. Everyone said how Larry would have loved it. 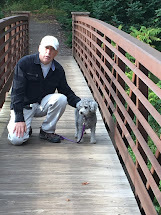 He was a great outdoorsman and loved the wild and the woods. So, yes I am slowly coming around to the fact that pumpkin season will be here. 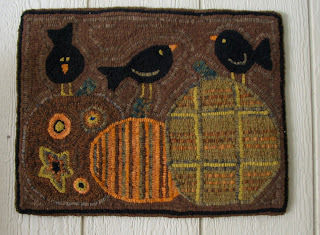 I dug out a few past Fall pumpkin rugs and a little Halloween mat that needs to be finished. 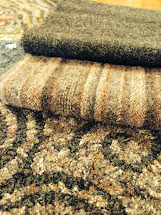 I'm getting a collection of rugs to roll up and display in the studio. I love displaying them this way. Do you? I'm glad to be back pulling loops and visiting with you all here again. Thank-you again for all your kind emails, prayers, and concerns for our family. Indeed it is an honor to have so many friends here in blogland.